Summer is my less-busy season at work (I say less, because it's always sort of busy...), so Dave and I make it a priority to get out and do fun stuff on the weekends. However, this does not mean that we can go all crazy like and be spending money all over the place. Responsibility and all that. The fun thing about summer time is that there is a ton of fun stuff to do that ranges from cheap to free. And I'm all about it. - Go to the beach. All you need are chairs or a blanket, beverages and some sunscreen. - When you have to beat the heat, go see a movie. Matinees are cheapest! - Go on a walk around your neighborhood. Or, more fun, around a new to you neighborhood. - Have a picnic. Enjoying your meal outside immediately makes it more special. - Go to the Farmer's Market. - Check out a street festival. Walk around, and grab a bite to eat while you're there! - Watch the sun set. - Go on a bike ride. - Listen to a free concert. You may find something that you didn't know you love! - Go to the flea market or thrift store. - Explore your city. Be a tourist for a minute and see all your city has to offer. - Take on a DIY project! It can be big or small! - Make dinner for each other. Do you have any go-to date ideas for the summer time? How important is it to you that dates in the summer be cheap? We're going to try to be tourists in our a city a lot this summer! I'm excited! Such a great list! 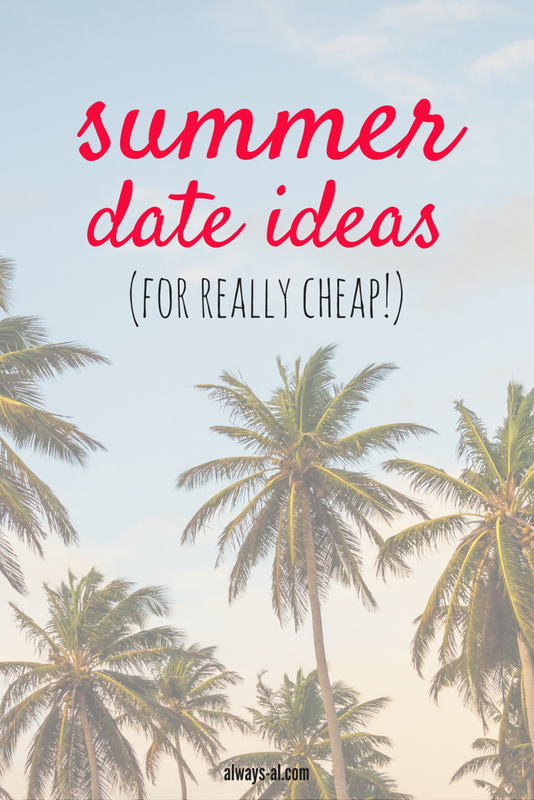 I had a summer date ideas post on my own blog a few weeks ago, but then I had some technical difficulties and it got deleted along with a couple others. I was sad. So many people loved it haha I'll have to re-do it at some point. I love to do that! Good exercise too!! Aww you should re-post it! I hate it when stuff like that happens! I might! It's just the fact that I'd have to completely re-type it haha And of course the other post I lost, was a sponsored one. I made sure to get that one back up ASAP. I love these ideas!! Dates in the summer are always the best:)! Thank you for more ideas! !